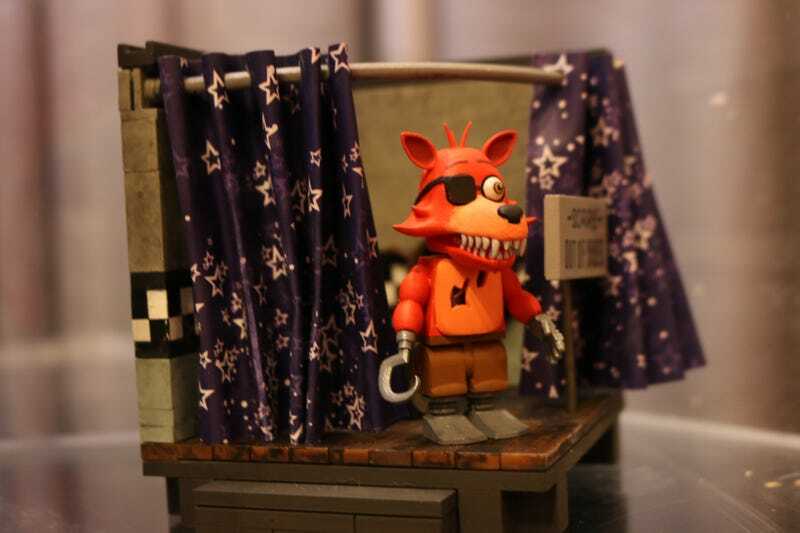 Earlier this week we gave you a first look at McFarlane Toys’ upcoming Five Nights At Freddy’s building sets, but it wasn’t enough. Where’s Foxy? Where’s the office set? Where’s Golden Freddy? Right here. Step inside, kids. In the Backstage building set Chica takes a load off, in the form of her hands. It’s a backstage hall of heads, apparently. See one you like? Meanwhile, in the office, you’re dead. You’re just dead. Sorry. Golden wants none of your screams. Okay, Golden wants all of your screams. And finally we’ve got the Pirate Cove set, which is Out of Order. This suits Foxy just fine. Actually he looks a little sad. All of these sets connect together with the Show Stage set to form one giant nightmare. Speaking of giant nightmares, over at the Neca booth. . .
That’s a three foot tall foam replica in prototype form. Imagine the places you could hide one of those at night. Plenty of delightful Freddy toy action coming our way this year. And in case you like your jumpscares at a lower resolution, I leave you with these.